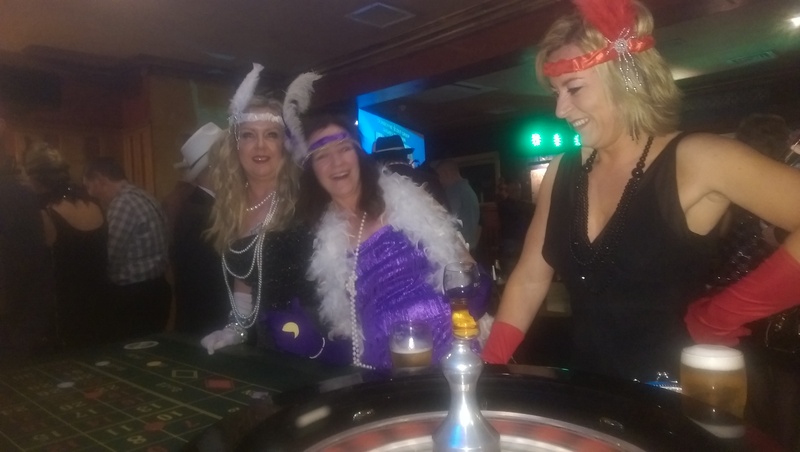 The Premier Fun Casino recreates a fully operational casino at your venue...with all the thrills and spills of the real thing..with one difference...We don't use real money! Our Fun Casino lasts for two hours. 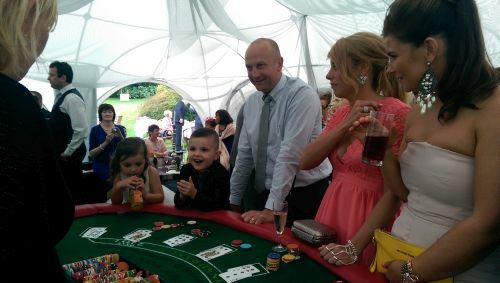 We will have our casino games tables in place, meet your guests & distribute fun money to everyone then introduce the games and direct guests to take their fun money to tables, exchanging this for playing chips and the games begin! An hour and and three quarters into the casino, we count everyone’s winnings and the seven guests holding most winnings enter the grand final on our high rollers Blackjack table. The casino finishes on a great crescendo with everyone roaring on friends, colleagues and relations. We provide professional Blackjack and Roulette with the option of our Texas Holdem Poker tables. Our bubbly, professional staff are dressed in full casino attire and will entertain everyone throughout! You may wish to provide a prize for the winner – anything from a bottle to a voucher to a break! Our professional full size tables are manufactured to accommodate any venue, however large or small & are assembled and broken down in minutes! Distance is no object & there really are no limits! we have tweaked the games to make them even easier! Why should I hire a Premier Fun Casino? Professional, bubbly Staff , sparkling equipment, lights and music. Everyone is included! Guys, Girls, the young and the young at heart. Everyone will have a ball. There really is nothing like the glamour of a Casino… with the click of the ball on a roulette wheel and the snap of cards dealt by professionally attired croupiers from behind the games tables. It's totally unique and so simple. Your guests will be amazed and captivated.Most of all it’s a fantastic, totally inclusive evenings fun and once your guests have started they will not want to stop. What Event Work Best With A Fun Casino? I Don't Know How To Play Casino Games! Blackjack: The most popular casino game, similar to pontoon or 21's. Blackjack offers the skillful (or lucky) player the best percentage return! The name of the game is to beat the croupier. Everyone is dealt two cards with the option of taking more, Anyone getting closer to 21 than the dealer wins ..Blackjack made Easy! Can you count to 21? Yes! Then this is your game. Roulette : Certainly the best-known casino game easy to play. Simply bet on the ball landing on red, green, odd or even, or bet with a series of numbers of your choice. Either way the spin of the wheel decides! Great fun and certainly the most glamorous of the casino games! Like a game where you have to be lucky? You bet ..its Roulette! How do I book a fun casino night? OK - Just let us know how many people will be entertained (approx.) and we will suggest the appropriate number of tables. You have a choice of Roulette, Blackjack and Texas hold'em poker all complete with table accessories and croupiers. We can advise you on your choice of tables! Do we play with real money? We never use real money…subject to the Gaming & Lotteries Act 1963 which prohibits unlawful gambling! Premier Fun Casino is a fantastic evening’s Entertainment…. where no one loses and everyone finishes with a smile on their face!